How Can You Optimize Your Candidate Journey? Before we turn to the question of how we can optimize the candidate journey, we should first clarify why it’s important at all to optimize the candidate journey. 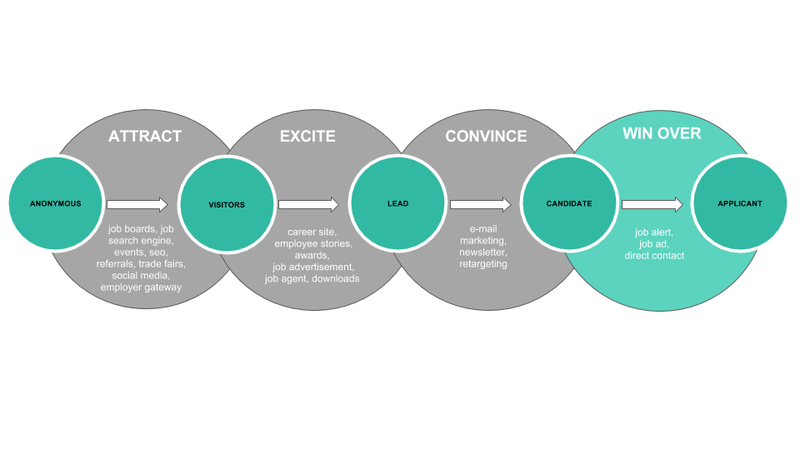 The candidate journey is the path the candidate goes through when he applies for a job with your company. The more positive the candidate’s points of contact with your company are, the more completed job applications you’ll receive. Are you not getting enough applications or none that are qualitative? Then you should take another look at your candidate journey and find out whether you can optimize it. Go through the single steps of the candidate journey. Which part could be optimized? In this phase, the candidate first has to find out about you in order to build up the initial contact with you. Can you be found on employer gateways? Are you easy to find in search engines (Google, Bing, job boards, job search engines)? Are you represented at the key trade fairs? In this phase, it’s important to identify the anonymous visitor and get him to leave his contact details. Does your career site excite the anonymous visitor so much that he’ll leave his contact details? Have you provided the most important conversion contents (job agent, job newsletter, downloading of contents)? When the visitor has been identified as a lead, you must convince him about your company as an employer. Usually, newsletters are used for this purpose. Does the content in your newsletter lead to candidates being convinced of you as an employer? Do you segment your leads according to your candidate personas and do you contact them accordingly? During this phase, it’s important to motivate the candidate who has already been convinced to send his application. Are your application processes streamlined today? Do you use job alerts to inform convinced candidates about open vacancies?